Special Containment Procedures: At least one healthy mated pair of SCP-2323-A must be contained. Free-flight hunting and live feeding is required for continued maintenance of SCP-2323. Standard outdoor netted aviary enclosure (including mews) is sufficient for containment. Use standard avian cages to house SCP-2323-A specimens as required for enclosure maintenance, veterinary care, inclement weather, transport, or research. The enclosed grounds must include a variety of insect-pollinated flowering plants. Enclosure must include a minimum of 1 m barbed wire (with a metallic iron content of 90% or greater) per adult SCP-2323-A, strung and elevated 1-3 m above ground (with 0.25 meters minimum spacing between strands). All SCP-2323-A specimens must be tagged with standard ornithological tracking tags, microchips, and GPS transponders. Specimens that breach containment must be recovered or destroyed immediately. Any Lanius excubitor specimen that has been exposed to SCP-2323 and is not required for maintenance of this SCP or for research should be destroyed. NOTE: This SCP does not contain the anomalous prey entities of SCP-2323. These appear to be present in the environment wherever insect-pollinated blooms occur [see 1]. Description: SCP-2323 is an anomalous behavior in great grey shrikes (Lanius excubitor). It is memetic in the host species, and is both learnable and transmissible (successful transmission rate of 64% to wild-caught mates and 87% to captive-raised offspring)[see 2]. Carrier organisms (designated SCP-2323-A) are otherwise non-anomalous specimens of L. excubitor, presenting typical vital signs and observable behaviors. While SCP-2323-A specimens will demonstrate non-anomalous hunting and feeding, using both natural thorns and barbed wire to impale prey,1 they show an observable preference for SCP-2323. While engaged in SCP-2323, SCP-2323-A specimens are observed to capture non-visible entities (both on the ground and airborne) and exclusively use the barbed wire for feeding. If barbed wire (or other high iron content metallic "thorns") is not present, SCP-2323-A will not engage in SCP-2323, but instead feed entirely on non-anomalous prey. Unidentified vocalizations from the prey entities can be detected in high-frequency audio recordings of SCP-2323. While the entities remain non-visible during feeding, the wire barbs used for feeding on non-visible entities become coated in blood. This blood is mammalian, but does not match any known mammal [see 1]. Starting in 1986 (the third year of containment), circular clearings with a mean radius of 0.36 meters have appeared annually in the enclosures. These clearings are surrounded by a ring of fungal fruiting bodies of a species of non-anomalous macrofungi already present in the environment, and contain anomalous objects (see Addendum- Excerpt from Document SCP-2323-D). These anomalies appear at night, typically between March and August, with the highest frequency occurring between April 20th and May 10th. Neither video surveillance or direct observation has been able to observe these clearings being made or the objects appearing; these phenomena occur only when and where observation is not being made. Continuous video observation of the enclosure fully prevents manifestation of these anomalies. Currently a mating pair (SCP-2323-A-07 and A-10) is contained at Site-██ with offspring (A-12, A-13, and A-14). A second pair (SCP-2323-A-09 and A-11) is contained at Site-██. SCP-2323-A-08, an adult male, is being used for research at Site-██. Addendum-Excerpt from Document SCP-2323-D: The following items were recovered from a circular clearing (with a radius of 0.41 m) in the enclosure containing SCP-2323-A-03 and SCP-2323-A-04 in May of 1988. These items are typical of objects that appear within this SCP during spring. A rectangular limestone block, 155 mm X 50 mm x 20 mm, showing signs of having been worked with stone hand tools with an average striking surface of 3.7 mm. A cured hide of the common vole (Microtus arvalis), found draped over the block. Bloodstains in this hide corresponded to the unknown blood found on wire barbs in the same SCP enclosure. Two 80 mm lengths of rope made from woven spider-silk with a mean cross-sectional radius of 1.2 mm. Each rope was passed under the limestone block, 12mm from either end and terminated in loops (radius of 4.3 mm) on each end. These loops contained traces of the anomalous mammalian blood. A 403 mm long branch of the common hawthorn (Crataegus monogyna) stripped of leaves and berries and "planted" upright in the ground. The thorns were decorated with discarded feathers from SCP-2323-A-03 and A-04 secured with spider-silk cords along with tufts of Canis lupus hair.2 This was located 73 mm from the center of the limestone block, perpendicular to its longitudinal axis. 7% consists of undigested cured animal hides (primarily rodents) and woven textiles made from spider-silk and plant fibers. 6% consists of stone tools (average mass 1.4 g) showing advanced neolithic techniques, including knives, arrowheads, and spear-points. 31% consists of bone fragments, which other than size (mean length 1.5 mm) are identical to human specimens. 1. 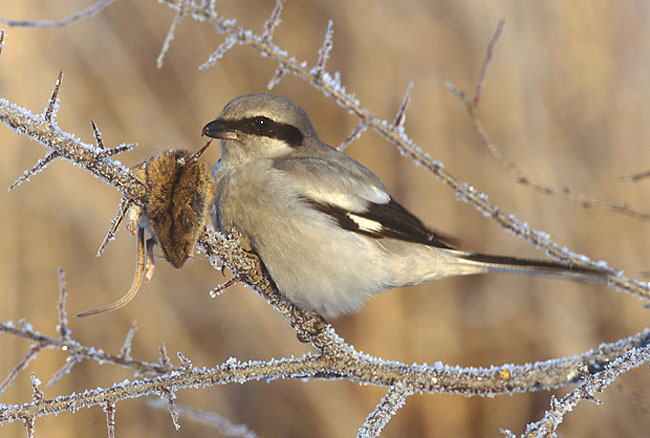 Shrikes are passerines (songbirds) and lack the talons of other birds of prey. They feed by impaling their prey on thorns and tearing it apart with their beaks. 2. Genetically matched to SCP-2952. 1. Ryan, Uwe, and Watanabe, Anomalous Hunting Behavior in Lanius excubitor, Journal of Biological Anomalies, Foundation Internal Publication, March 1987. 2. Ryan, Uwe, and Watanabe, Memetic Transmission of Anomalous Hunting Behavior by Lanius excubitor, Journal of Biological Anomalies, Foundation Internal Publication, January 1991.